Through painting you will discover in yourself a greater awareness of the beauty of nature. 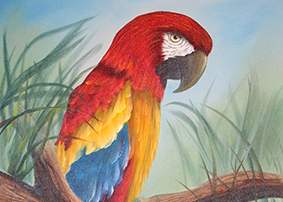 The Bob Ross wildlife certification classes, in 3 levels give you a wonderful chance to capture and reproduce paintings easy to teach in workshops. The friends you make during your certification seminars are for a lifetime. You will receive special coaching on becoming an effective Bob Ross® Instructor, motivating beginners and correcting your students mistakes. Unless otherwise indicated, don’t try to use other paints or tools for this technique. His wildlife supplies are indeed different, they’ve been developed especially for creating furry friends. Courses available on demand. Please contact me for more informations.